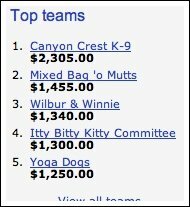 We've passed Yoga Dogs and now we're nipping at the heels of Wilbur and Winnie! Click HERE to help us get one step closer to our goal! Go Kitties, Go!